Gujarat University MSc Nursing 1st Year Exams Timetable 2016 and Hall Tickets Download at Official website http://www.gujaratuniversity.org.in/web/index.asp , Admit Card . Gujarat University Nursing Exam Dates 2016 , MSc Nursing 1st year Exam Schedule 2016, M.SC Nursing Exam Hall Tickets , Timetable Copy Download for Gujarat University, Ahmedabad University MSc Nursing Exam Admit Card Download Timetable 2016. Programme of the FIRST YEAR M.Sc. (Nursing) Examination—April, 2016 Candidates for the above examinations are Instructed to remain present fifteen minutes before the scheduled time. Candidates are forbidden to take any book, Paper or any kind of HAND-WRITTEN / typed / printed material, programmable calculator, Mobile Phone, any type of electronic device into the Examination Hall. 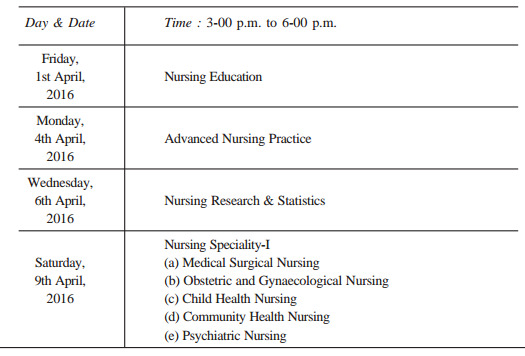 Nursing Education Exam Dates , Advanced Nursing Practice Exam Timetable , Nursing Research & Statistics, Nursing Speciality-I, Medical Surgical Nursing, Obstetric and Gynaecological Nursing, Child Health Nursing, Community Health Nursing, Psychiatric Nursing Exam Timetable 2016. 3. The Practical examinations will take place after the conclusion of the written examinations. Due notice will be given by the University (on the University website) of the dates, time and places of Practical examinations and the order in which candidates are to present themselves. Candidates are directed to be present at the time and places scheduled for their Oral or Practical examinations. Those who fail to present themselves at the scheduled place will not be examined in Oral or Practical examinations afterwards. Ahmedabad-380 009 Rajesh Patel March 9, 2016 I/C. Controller of Examinations.